Birth to 22: United for Brighter Futures is an alliance of community partners who are working together to support the healthy growth, development and education of our children and youth, prenatal through young adulthood, so that they can graduate from high school and succeed in life. 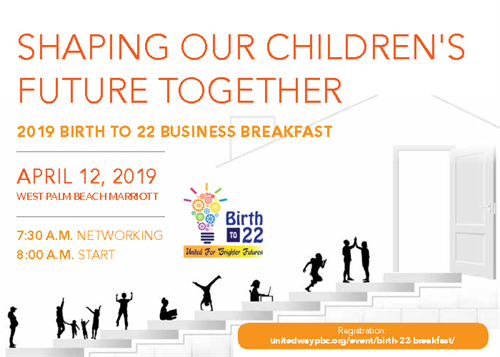 We are excited to announce our inaugural Business Champion Awards which will be presented at our 2nd Annual Birth to 22 Business Breakfast: Shaping Our Children’s Future Together which will be held on April 12, 2019 at the West Palm Beach Marriott. For more information about the Business Champion Awards, please visit the link here. For more information about registration/sponsorship opportunities, please visit the link here.